If you would like to start eating healthier but do not have time to cook, meal delivery services may be the perfect solution to your problem! Check out or objective Takeout Kit VS Sun Basket comparison to get a better idea of what these two services offer and determine which one is the right choice for you and your family. Takeout Kit is a budget-friendly, family-friendly meal kit service that provides authentic imported ingredients and quick, easy-to-follow recipes for the most popular meals and drinks from around the world. With Sun Basket, you can handpick recipes that suit your taste, diet, and lifestyle, decide on the number of recipes you want to order per week, double or triple your order when you need more food, choose between high-quality and premium meat options, and completely personalize your orders and meal plan. With Takeout Kit, you can choose between individual kits, samplers, and subscriptions. If you opt for Takeout Kit's individual kits, you have 13 options at your diposal. There are 9 samplers and 3 drink kits on the menu as well. The company also offers 4 subscription plans, which differ only in the subscription length. With Takeout Kit, you can cook hallmarks of various African, Asian, European, and South American cuisines. You can opt for omnivore, carnivore, vegan, and vegetarian delights and choose from a nice selection of meals, coffee, teas, and iced tea kits. The meals are usually ready in 30 to 45 minutes. Takeout Kit mainly uses USDA-certified organic and preservative-free ingredients of the finest quality. However, since many of its ingredients are imported to ensure authentic flavor, it is not always possible to obtain preservative-free products. Takeout Kit offers meal kits designed to feed 4 adults with a hearty appetite. Individuals who do not have a big appetite may find the portions to be too large. The calorie count ranges from 200 to around 500 calories. The meals are generally well-balanced but can be rather high in carbs. With Takeout Kit, if you would like to modify or cancel your subscription, you must do it before the 15th of the month. Keep in mind, however, that you can only cancel your monthly subscription. If you are not satisfied with your delivery from Takeout Kit, that is, if you are missing an item in your order or get a damaged or incorrect meal kit, you can contact the company within 7 days of the delivery day and either receive a replacement, credit or refund. With Sun Basket, you can choose between the Classic Menu and the Family menu. Sun Basket features 18 new dinner recipes and around 12 add-ons on the Classic Menu and 6 new dinner recipes on the Family Menu each week. 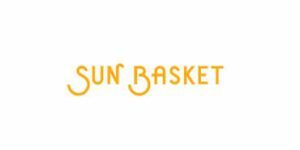 Sun Basket offers Paleo, lean and clean, gluten-free, vegetarian, vegan, pescatarian, Mediterranean, Heart-Check certified, dairy-free, soy-free, and family-friendly dinner recipes. Most meals are ready in around half an hour and there are plenty of easy-prep, one-pot, stir-fry, and make-ahead options. The recipes are inspired by various world cuisines, including Thai, Italian, Vietnamese, Mediterranean, American, and Mexican. In addition to dinner recipes, the service offers 5-minute salads, signature sauces and dips, and veggie snacks available as add-ons. Sun Basket sources the best organic produce of the season, its seafood is of the highest quality and recommended by the Monterey Bay Aquarium Seafood Watch, and its meat is humanely raised, grass-fed and free from antibiotics and hormones. The average calorie count for Sun Basket meals is between 500 and 800 calories per serving. All meals are optimally balanced and approved by its in-house nutritionist. The meals on the Classic menu are perfectly portioned for 2 or 4 adults and the ones on the Family menu are designed for 4 adults with leftovers. With Sun Basket, you can make changes to your order or skip, pause, and cancel your delivery at any time. All changes must be made by Noon PST / 3pm EST the Wednesday before your delivery is due. Sun Basket boasts an excellent 100% money-back guarantee, so if you are not happy with your order for whatever reason, just notify the company within 7 days of delivery and you will be issued a refund or credit. Marvelous idea and excellent product, thank you! The kits are easy and fun, practical and affordable. We enjoy the preparation and the entire experience. We also enjoy sharing kits with friends as gifts. Ever try to prepare risotto? Well, don’t bother, just buy this kit! Easier than other meal kits, real good food, I usually cook twice with 1 kit. The only problem is that some ingredients are hard to divide in two, I have to repack them, it's a bit of a hassle. It's not exactly single-friendly. Quick, tasty and really fun, I love reading about the dishes and they are really different from anything else I've tried. The prices are good too, I googled some of the products in the kit, they can get real expensive. Perfect for families, get ready for a lot of leftovers if you are cooking for 1-2. I am extremely disappointed with this meal subscription service and I have tried a few of them. They have a no-refund policy, which other meal subscription services I have used do because sometimes it's hard to skip every week. On top of that it was hard for me to figure out how to put my account on hold. I tried to get them to cancel my account in November and it didn't work so I had to just skip a bunch of weeks and try to figure out again how to close my account. Then when I finally didn't get the time to skip a bunch more which is also hard to do via your phone and tried over and over to get my account put on hold via desktop and mobile it caught up to me and they charged me over 80$, all they could do was give me 20$ back and say I think that's more than fair, uh no that's horrible customer service. They say they don't have the man power to take your package off the line, well you should figure something out if you want people to return to you in the future. And now I wont be able to pay my bills because of them. If they can afford to give out 80$ coupons, I think they can afford to refund me ALL my money back. I don't recommend them If you want an easy to use, and refund friendly subscription. BTW this happened to me twice with them. I am a busy mom and I promise you I tried several times to straighten this out, it's not easy enough. I've tried home chef, freshly and plated. I’ve been trying to use much more veggies and healthy foods in my diet recently and I also discovered my love for international cusine and I have Sun Basket to thank for all that. I became a real adventurer when it comes to food and I get to enjoy loads of different recipes every week and share them with my loved ones. As with any meal service, there’s gonna be some repetition but not even close as much as with some other companies I used in the past. One of the best things about Sun Basket for me is the fact that it reduces food waste by a lot. I simply get the exact amounts I’ll need to make any particular dish and never end up with an extra head of cabbage or something like that. It has also reduced my visits to to the store to let’s say basically once every week. As a single dad, my life has two big eras, pre and post Sun Basket. I completely forgot what it feels like dragging my kids though the convenience store trying to cram everything I need inside a shopping cart, listening to new school adventures and trying to think about lunch at the same time. Sun Basket is incredibly convenient, saves a ton of time every single day, and provides my family with high-quality food I could never get even close to making without their help. Great service, definitely recommend it to everybody who wants to save some time, money and sanity on everyday eating.